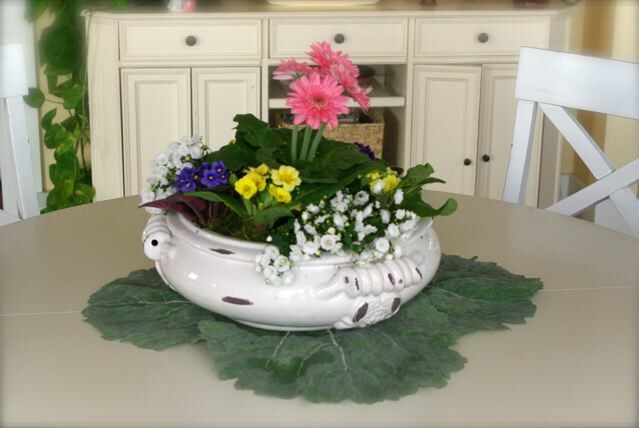 Do you remember the Living Spring Centerpiece and the Fairy Garden projects? Well, I was needing a little “plant time” last week and hopped on over to one of my favorite local nurseries/garden centers (Dickman Farms in Auburn, NY). 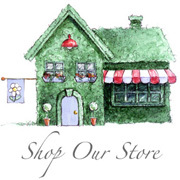 They have a wonderful greenhouse selection and to my surprise/delight all of their house plants were 50% off! Sa-weet. I knocked myself out. Now, before I go further, you must know that I was driving hubby’s car listening to the new Coldplay CD Mylo Xyloto for the first time. I pulled up into the parking lot and was completely overcome listening to #5 – You and Me Against the World. Oh. So. Warm and Beautiful… the acoustic guitar and Gwenth’s Chris Martin’s voice. 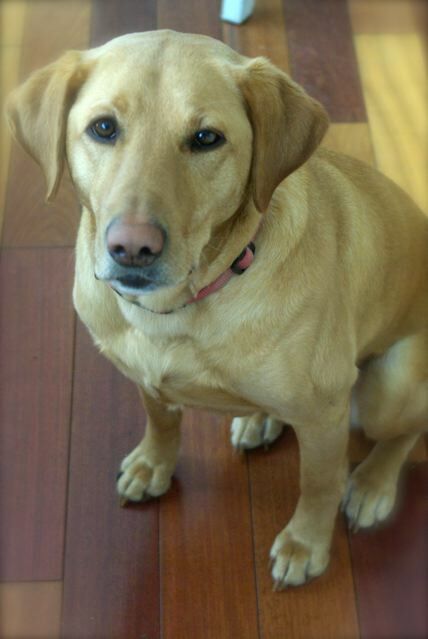 Love….Love. Where was I? Shopping. I’m not a shopper typically- much to Farmboy’s delight. 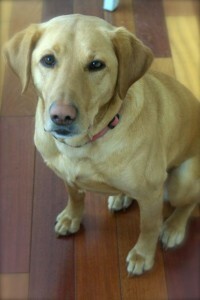 Plants, plates and ponies are some of my preferred items- much to Farmboy’s dismay. When I need a little retail therapy I head for the local nursery or Marshall’s rather than a horse sale, thankfully- for all of us. Enough of my late-night, The Clone Wars is on (they all look the same)- pontificating. Here is the “how to” part. 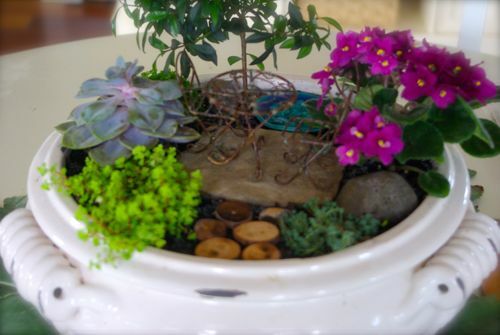 Take a large container with no hole and fill the bottom third with gravel for drainage unless you plan to use a saucer of some sort to catch the water. 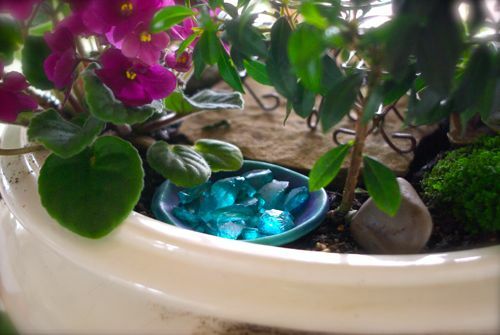 Be especially sensitive to moisture when using a container with no drainage. Low and wide is better since it will be displayed on a table indoors. 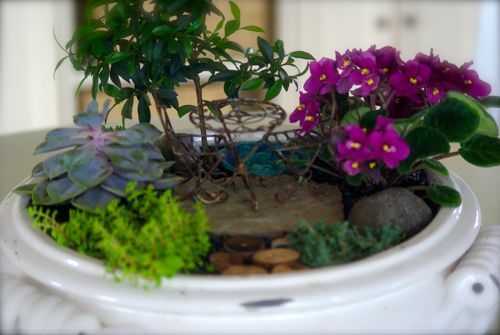 Fill the remainder of the container with potting soil. 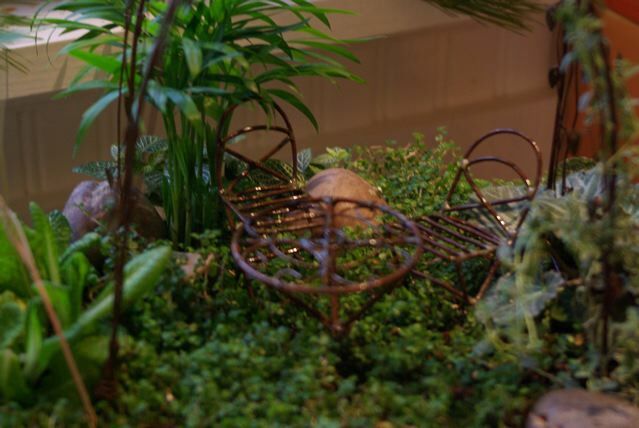 Arrange low growing, mossy plants in the front and center of your Fairy Garden and add the taller ones to the back. 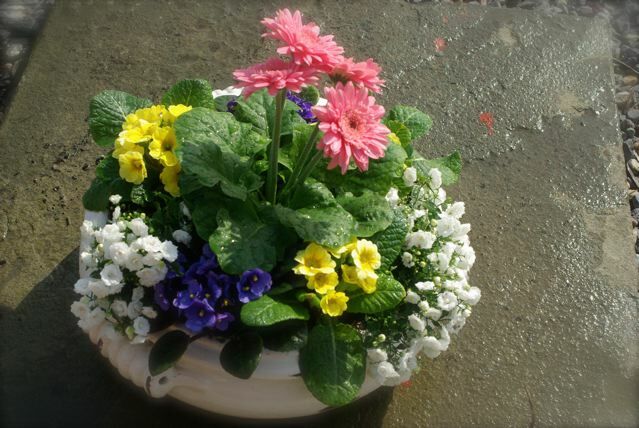 Once your plantings are finished water gently until evenly moist. 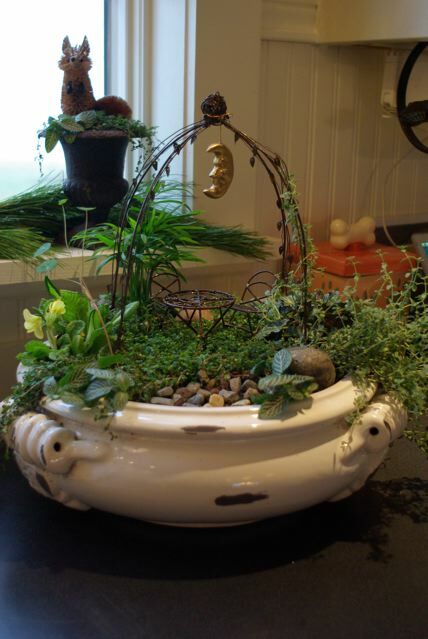 * I found some wonderful Fairy furniture to add to my indoor garden at Dickman’s! 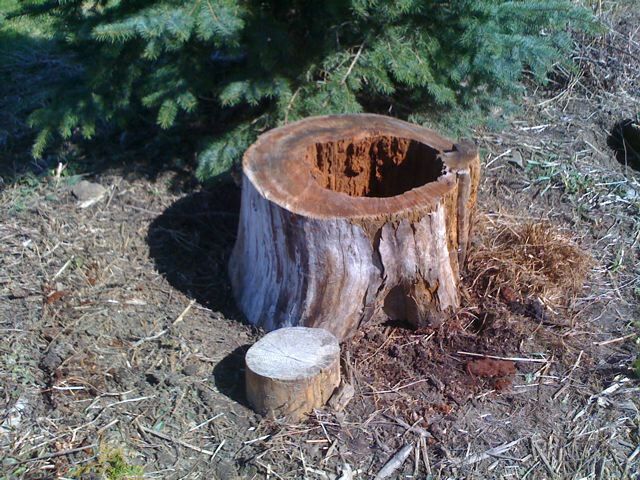 Here is a link to fairy furniture images. Be sure to add a stone path, some boulders (small rocks) and whatever you can think of to add ambiance! 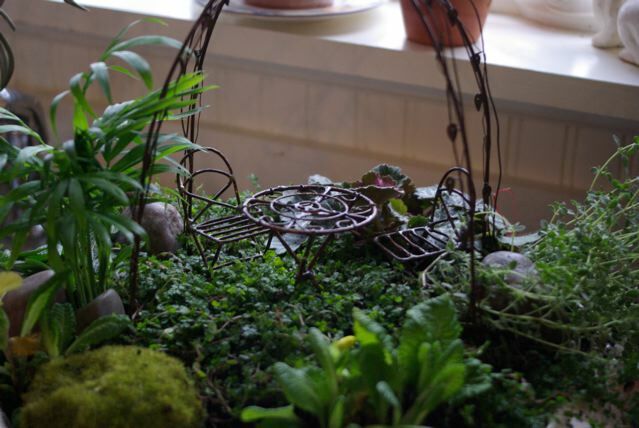 I wish that I could string lights in my little fairy garden. Wouldn’t that be great?! 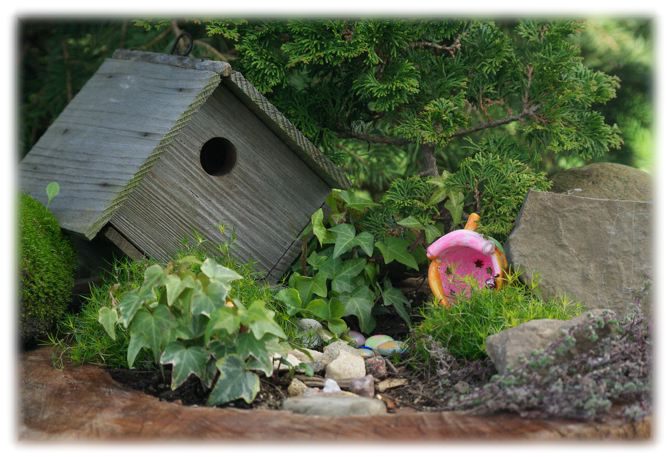 This little garden has been inhabited so far by the following: Zoobles, My Little Ponies and Princess Polly Pockets. I think its magic is working. Soon, word will get out and the fairies are bound to come. We have recently put little Santa hats out and decorated the place for Christmas. 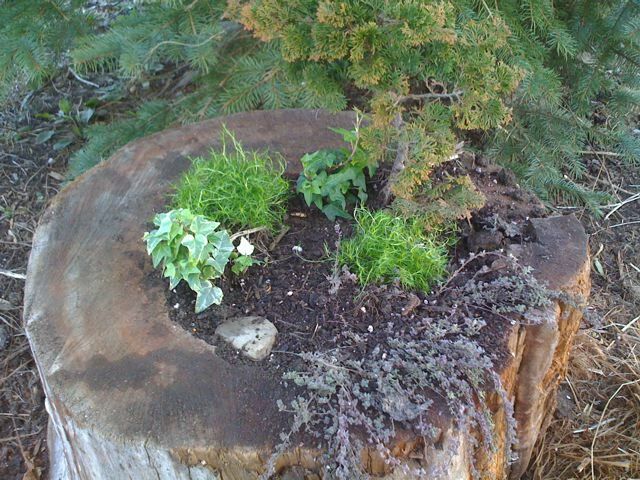 I’m thinking that it’s enchanting- I think the fairies will agree. I did not come up with this idea… I wish I could take credit for it. 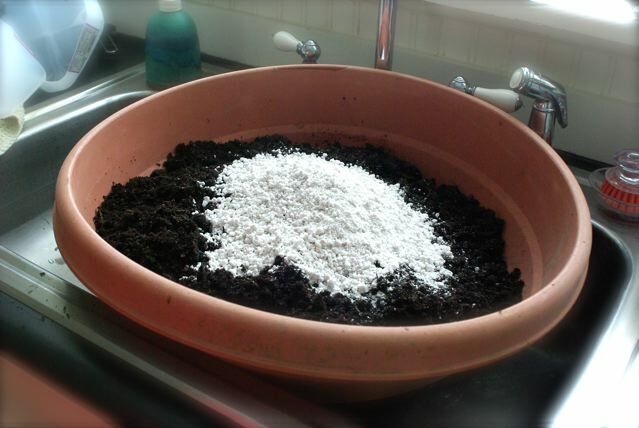 I learned about it from Trudy in the Winter Sowing forum on GardenWeb a number of years ago and have since grown hundreds of plants using this method. I thought it would be fun to show how LaLa and I do it. 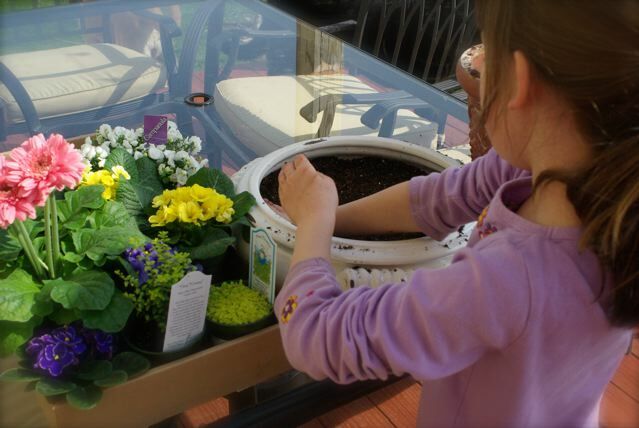 This post will be linked to other post that I will be doing regarding gardening with children… so stay tuned for that! 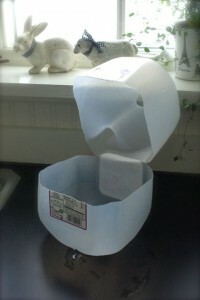 First you get a milk carton and add your drainage holes. I find it easier to label them before the soil is added. I’ve tried numerous pens and markers but have found opaque paint pens to work the best to handle the elements outside without wearing off. 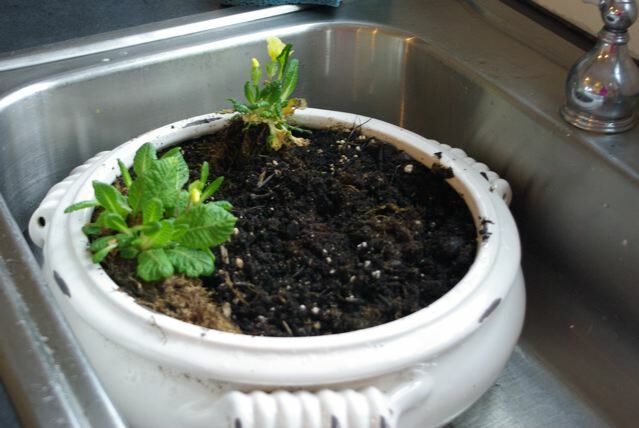 I usually fill the utility sink in the laundry room with potting soil if I will be filling numerous containers but today I only had 4 to fill and I thought this would be easier for LaLa. People use various mixes to start their seeds. I don’t fuss over it too much. 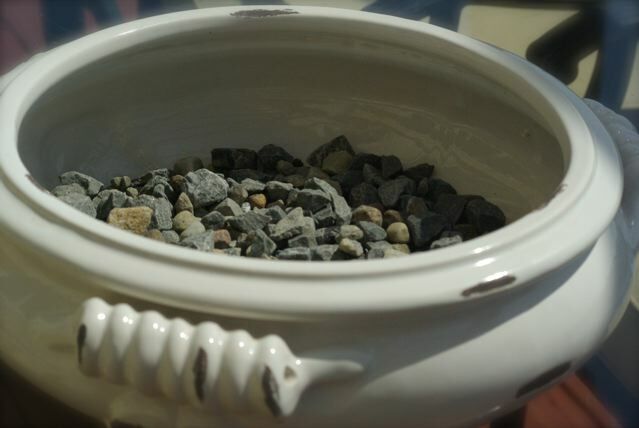 I normally use a regular potting soil (miraclegro) and add additional perlite to lighten the mix. 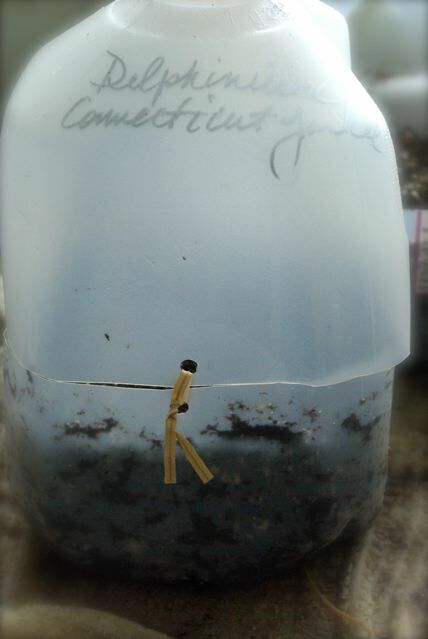 It is not necessary to use seed starting mix although I do add it to my potting soil if I have it. 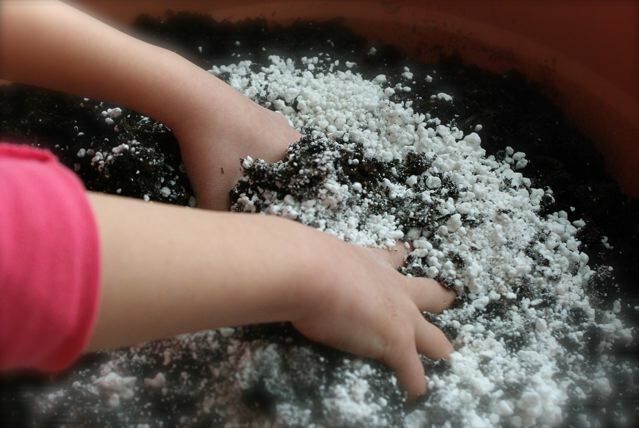 So… add your soil, add your perlite and get those little hands going! 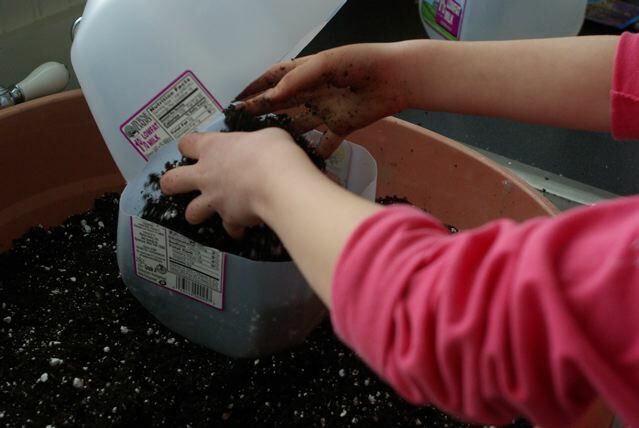 Children (and adults) love to get their hands in the dirt when there is 3 ft of snow on the ground! 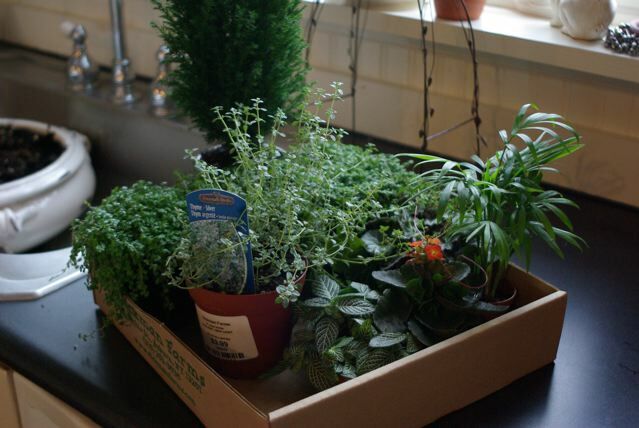 It gives me a little gardening fix to get me through the long winters in Upstate New York. 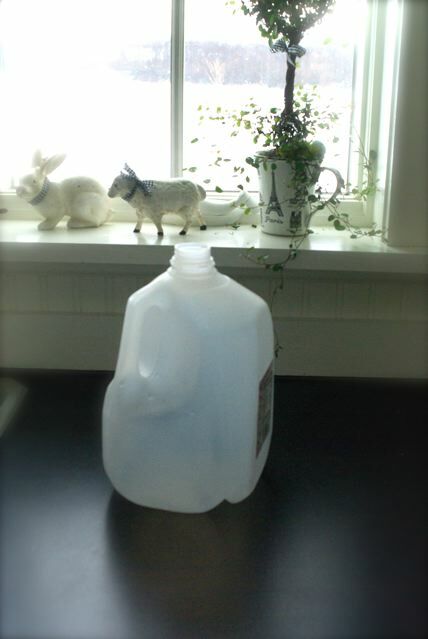 After your soil is mixed and moistened, then fill your carton. 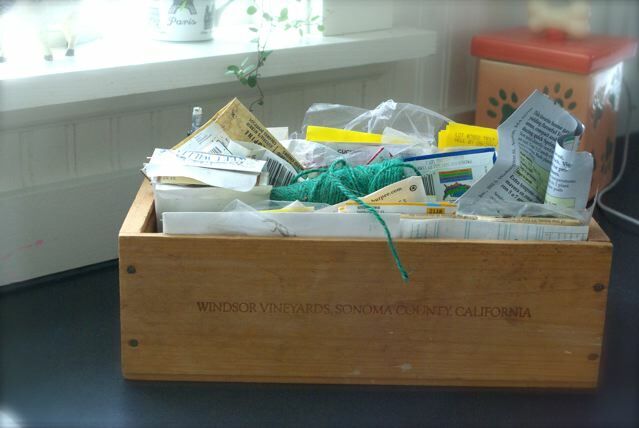 I keep my seeds in an old wine box. 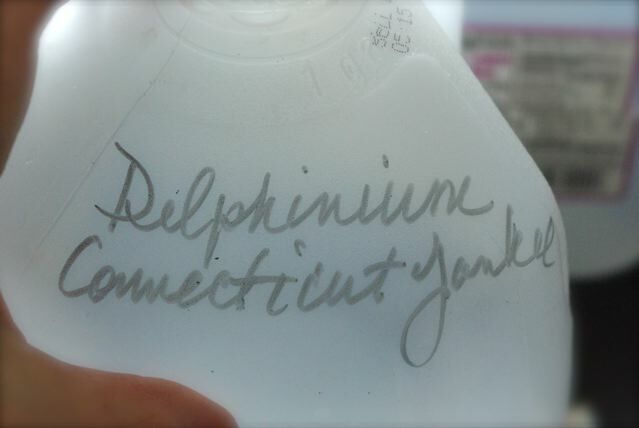 For some reason I cannot find most of my perennial seeds so we’ll go with Delphinium, Oriental Poppies and Lupines. Now sprinkle those seeds! 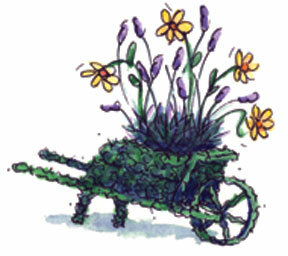 If they are tiny like poppies, just gently pat them to make contact with the soil. 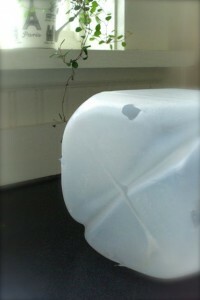 You can plant as little as 1 per carton but I usually sow at least 6 or 8 seeds (even with large plants). 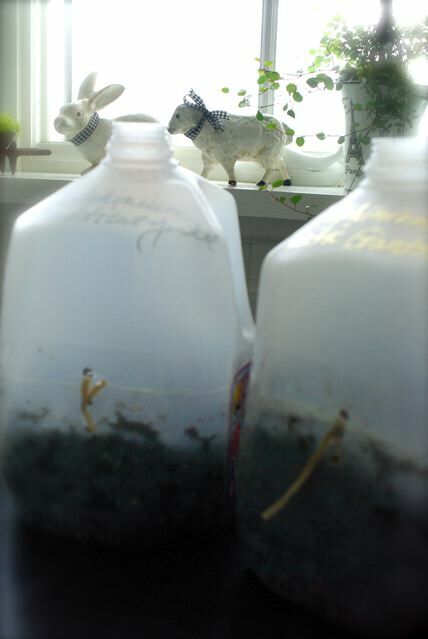 Once they get started they can be separated or planted out later. 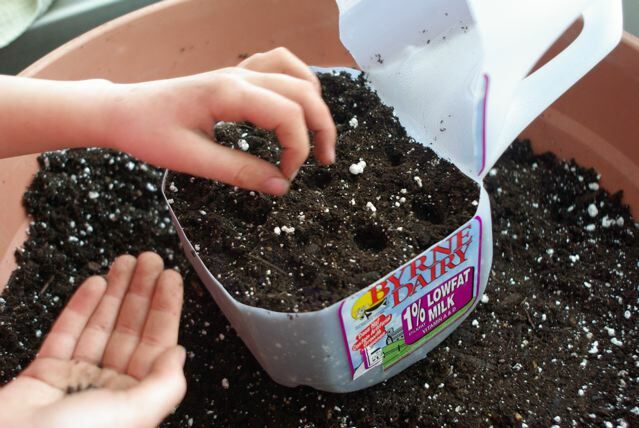 If your seeds are larger you can poke little holes to put them or just sprinkle more soil on the top once you are done sowing. 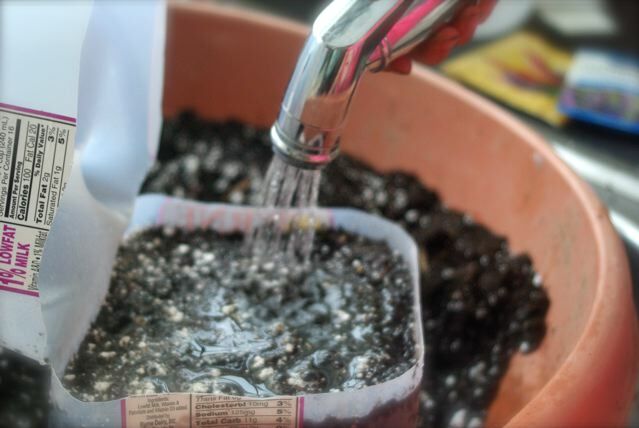 Gently water in your seeds. 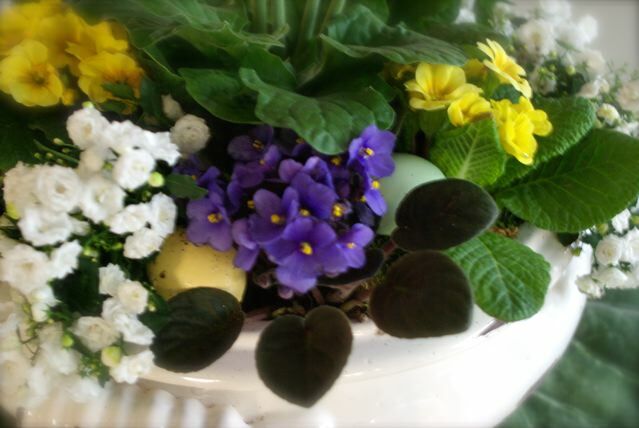 I water them numerous times… until the soil is completely soaked and draining from the bottom. Remember the top half of the carton gets put back on and they will use the water that you put in now as condensation as the mini greenhouses warm in the spring sun. 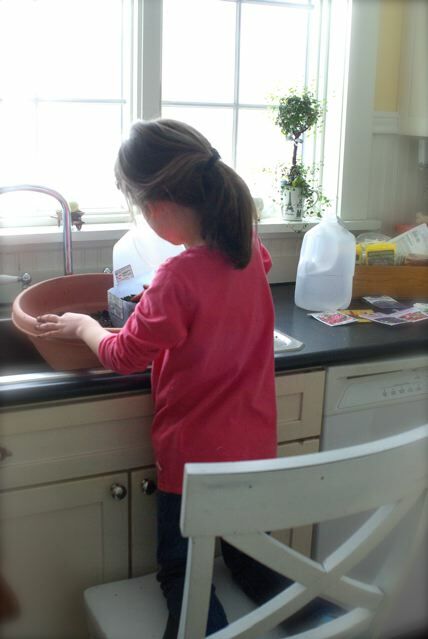 Watch your children when watering… they can be very overzealous as we know! 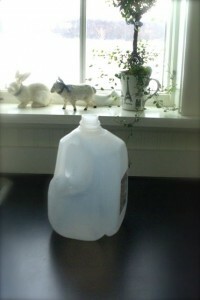 You don’t want the water pooling up on the top and your seeds washing away down the sides of the carton. At this point I put them in the sink and let them drain. I have found that using a hole punch on the top and bottom and provides a nice little way to thread a twisty tie to hold them shut. The last step is an important one. Tape your cartons around the middle. 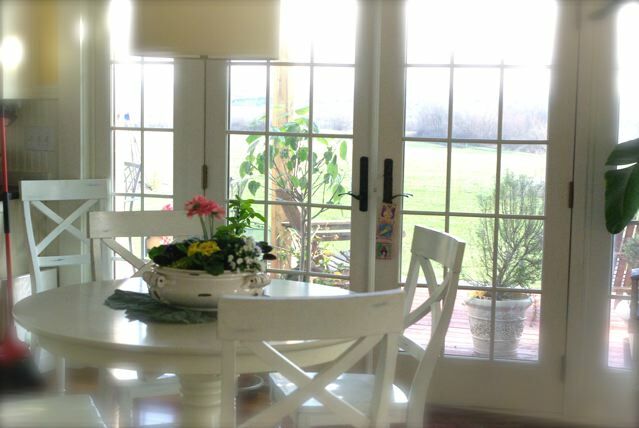 You want the air inside to warm as the sun shines on them. I use packing tape but duct tape works too. Don’t put the cap back on the carton. 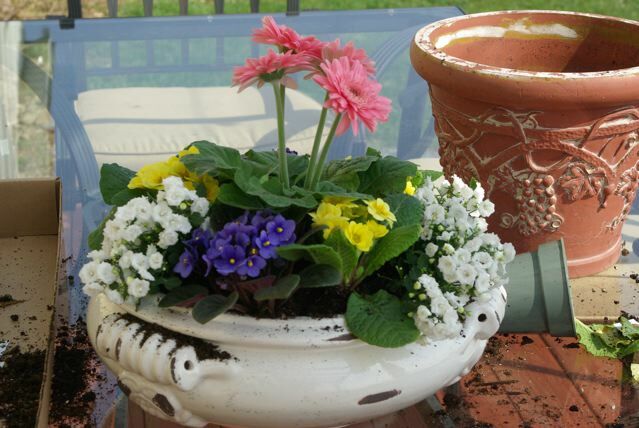 After that… put those little darlings outside and forget about them until the weather starts to warm. When they are ready they will sprout. 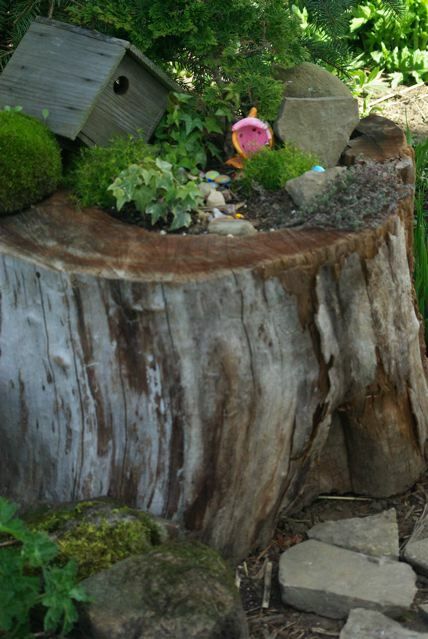 Your children will enjoy peaking down into the hole to look for green sprouts! I promise. 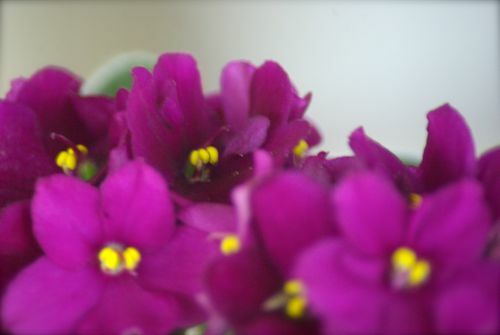 For more information on Winter Sowing click here. 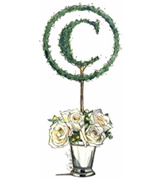 The forum is full of information, encouragement and overall gardening joy but be prepared to hear alot of rejoicing about green babies, zone wars and container counts!